At the University of Pennsylvania, WXPN-FM was the primary student-run radio station until 1975, when the station lost its license over an obscenity complaint. The license was later restored, the station grew under professional management, and today is a thriving noncommercial station that produces syndicated programs heard worldwide. The university's student-run station is WQHS, which stands for Quad Hill Superblock, an area of freshman dormitories. 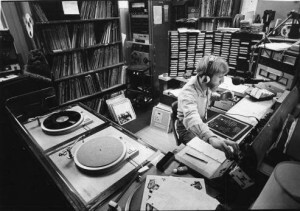 Initially, DJs such as Mark Hauser, seen here in 1980, broadcast using a tower atop Harnwell College House. However, the tower fell during a 2003 storm and WQHS has been broadcasting an internet-only show since. WPEN (950 AM) began broadcasting in Philadelphia in April 1929 and was bought by the Philadelphia Evening Bulletin in the mid 1940s. While WPEN was under the Bulletin’s ownership, several college and university radio stations broadcast from the WPEN newsroom, creating the Middle Atlantic Network of the Intercollegiate Broadcasting System. 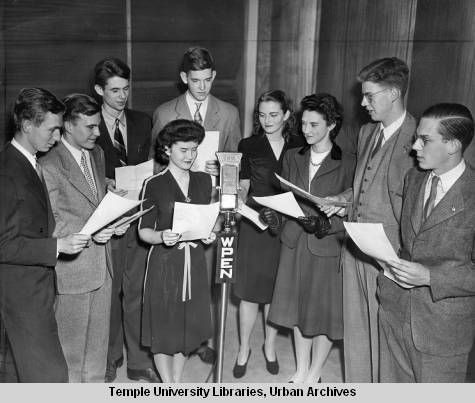 This inaugural picture from April 1946 shows students from Bryn Mawr College, the University of Pennsylvania, Haverford College, and Swarthmore College gathered around a single microphone, ready for their broadcast debut on WPEN. From radio’s earliest days, college and high school students in the Greater Philadelphia area have tested its boundaries. Student radio has been democratizing and distinct. Unrestrained by advertising sponsors, though sometimes constrained by school administrators’ concerns over content and control over budgets, students have freely experimented with format, content, and technology, and each class of students has made its own mark, distinctive from the year before. College students began experimenting with radio in the first decade of the twentieth century. Engineering majors at Villanova College (later University) created a radio club in 1908; University of Pennsylvania students formed theirs a year later. When the Radio Act of 1912 began issuing experimental broadcast licenses, the first in the nation went to St. Joseph’s College (later University). World War I placed a temporary hiatus on student experimentation, when the government revoked all licenses, but it resumed after the war. During the 1920s, students at Villanova, St. Joseph’s, and Haverford College all received licenses for AM frequencies. By the mid-1930s, as commercial radio dominated the airwaves and the cost of licenses rose, college students found a way around the high price of broadcasting by creating local carrier current, or “gas pipe,” networks. Carrier current broadcasts on a low-power AM frequency by using electrical wiring to propagate a limited signal. Students found they could move sound through their campus buildings by employing gas pipe lines, used for heating rooms, as antenna. In 1940, Swarthmore College, Princeton University, Haverford, Villanova, and the University of Pennsylvania all had student-powered carrier current networks. Following World War II, as commercial networks turned their attention toward television, the number of commercial radio stations dropped and FM radio came on the scene. With more frequencies available, the number of college stations expanded. High school teachers saw the educational benefits of radio and, like Haverford High School in 1949, sought licenses. A school’s radio station came to play an important role in its community. Student listeners tuned in to hear live broadcasts from the football field and the basketball court, band and choir concerts, and talk shows—all featuring their classmates. While high school teachers worked closely with their students on programming choices, students staffed most college stations. 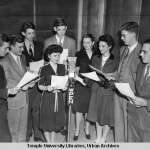 With little oversight from university administration, students pushed the boundaries of what they could do with radio. In 1975, the FCC revoked the University of Pennsylvania’s radio license for obscene programming. After a brief period off the air, the station was re-established, but with a nonstudent adult staff. In addition to content, students experimented with new technologies. Broadcasting in stereophonic sound closely followed the transition to FM and changed the way listeners heard music. Princeton became the first college station in the country to move to stereo in 1962. By 1970, most school stations in Philadelphia had followed suit. Format changes accompanied new technologies. When rock and roll exploded onto the music scene in the 1950s, student DJs found records from some labels difficult to obtain. At the same time, as school-funded organizations, student stations did not have to rely on corporate dollars. Inadequate access to the day’s biggest hits and freedom from advertisers’ expectations meant students could experiment with new sounds unavailable to commercial DJs, as singer Jim Croce (1943-73) did as a folk music DJ at Villanova in the 1960s. As the decades progressed, folk, alternative, indie, metal, and world music moved in and out of popularity with high school and college listeners. No matter the genre, student stations in the Philadelphia area consistently supported the local music scene. 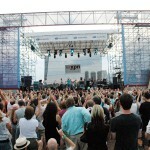 Some of Croce’s earliest performances appeared on the air at Villanova, and pop/rock duo Hall & Oates first met and played at Temple University. 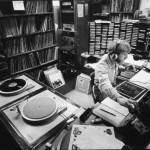 By the late 1990s, Haverford High student DJs hosted local stage events called “coffee houses,” and Drexel University’s WKDU regularly welcomed local talent into its studio for live events. 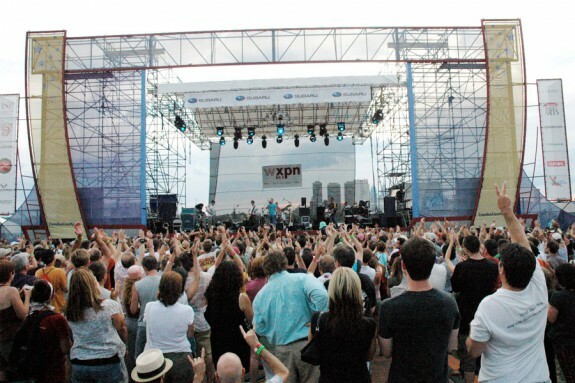 By 2000, Philadelphia’s FM frequencies filled to capacity. At the same time, the internet offered students a new frontier to explore. Student stations created websites that allowed listeners to “tune in” online via streaming applications or check out announcements for forthcoming in-studio and local performances. Some student-run college stations, like those at Haverford and Penn, gave up their broadcast licenses and moved to an all-online format. Free from government regulation, online stations offered students greater format flexibility and provided listeners the ultimate portability of streaming station apps through smart phones. When Haverford moved to an all-online format in 2009, students transformed the idea of radio from a listening experience into an experimental collective in which their audience could listen to audio while viewing accompanying multimedia content. In the early decades of the twenty-first century, student stations continued to create diverse listening experiences by introducing music unheard on commercial stations. They provided Philadelphia bands crucial airtime, and listeners could go see their favorites at local venues like Underground Arts and Johnny Brenda’s. Student stations continued to offer broadcasts of school sports, music, and talk. Mount Pleasant High School in Wilmington, Delaware, partnered with Delaware Public Media to locally produce NPR and Delaware news during periods in which student on-air talent was unavailable. Every year, hundreds of students across the Greater Philadelphia region participated as DJs or staff, widening their future educational and work opportunities while creating a unique subculture of youth radio. Escaping from mainstream music, Philadelphia’s student DJs embraced underground sounds that added depth to American music and to the experience of coming of age in the United States. Rachael A. Beyer is a Ph.D. student and Hagley Fellow at the University of Delaware, where she studies radio, youth, and community. She recently completed a year as the David Sarnoff Library collection processing intern in manuscripts and archives at the Hagley Library and Museum in Wilmington, Delaware. Bloch, Louis M. The Gas Pipe Networks: A History of College Radio, 1936-1946. Cleveland, Ohio: Bloch, 1980. Douglas, Susan J. Listening in: Radio and the American Imagination: From Amos “N” Andy and Edward R. Murrow to Wolfman Jack and Howard Stern. New York: Times Books, 1999. Sauls, Samuel J. The Culture of American College Radio. Ames, Iowa: Iowa State University Press, 2000. Schiffer, Michael B. The Portable Radio in American Life. Tucson, Ariz.: University of Arizona Press, 1991. Slotten, Hugh Richard. Radio’s Hidden Voice: The Origins of Public Broadcasting in the United States. Urbana, Ill.: University of Illinois Press, 2009. Cooney, Caroline B. The Voice on the Radio. New York: Delacorte Press, 1996. Coriell, Shelley. Welcome, Caller, This Is Chloe. New York: Amulet Books, 2012. Fisher, Jane Smith, and Kirsten Petersen. WJHC on the Air! Oceanside, N.Y.: Wilson Place Comics, 2003. Frost, S. E. Education’s Own Stations. New York: Arno Press and the New York Times, 1937. WSRN (Radio Station) Records, 1957-1997. Friends Historical Library of Swarthmore College at McCabe Library, 500 College Avenue, Swarthmore, Pa.
WXPN-FM Records. University of Pennsylvania Archives & Records Center, Suite 210, 3401 Market Street, Philadelphia. The RCA Heritage Program Museum at Rowan University’s Campbell Library, 201 Mullica Hill Road, Glassboro, N.J. Tours by appointment.